An automatic diet monitoring system using infra-red camera and gesture tracking. Abstract—In this paper, we propose MT-Diet, a smartphonebased automated diet monitoring system that interfaces a thermal camera with a smartphone and identifies types of food consumed at the click of a button. 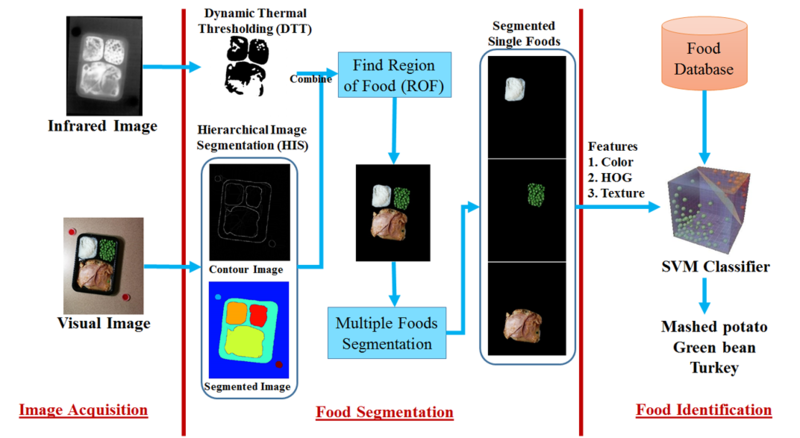 The system uses thermal maps of a food plate to increase accuracy of segmentation and extraction of food parts, and combines thermal and visual images to improve accuracy in the detection of cooked food. Test results on 80 different types of cooked food show that MT-Diet can isolate food parts with an accuracy of 97.5% and determine the type of food with an accuracy of 88.93%, which is a significant improvement (nearly 25%) over the state-of-the-art. 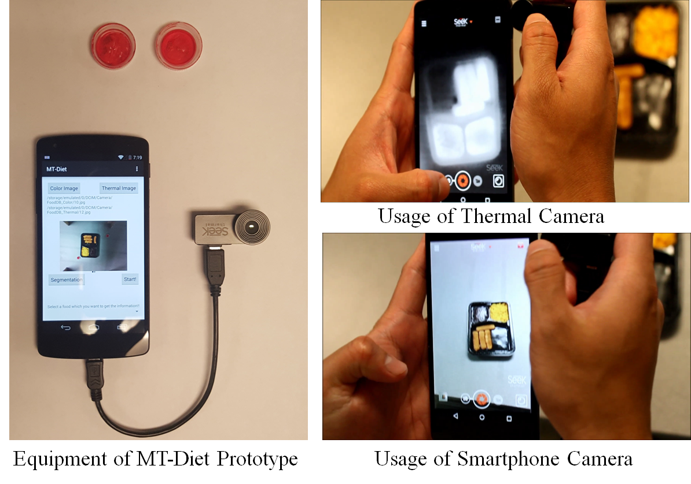 Conclusions: We introduced, MT-Diet an automatic diet monitoring system that interfaces thermal sensor with smartphone camera to provide accurate food identification. MT-Diet improves the accuracy of automated food identification to 88.93%, a 25% increase with respect to competitive techniques. The usage of thermal information not only helps in identifying the food portions in the plate but also in recognizing the type of food in a time efficient manner, within 2 mins of taking a picture. MT-Diet is an user-friendly diet monitoring application that is expected to promote healthy eating habits.